@iPower is a strong player in the hosting and domain names market, which is largely due to our dedicated user-friendly website for this service. All of our customers use it and cannot imagine life without it. In the meantime, @iPower has extended its services to include web design, search engine optimization, professional database services for new customers and prospects, e-marketing and tailor-made Internet applications. 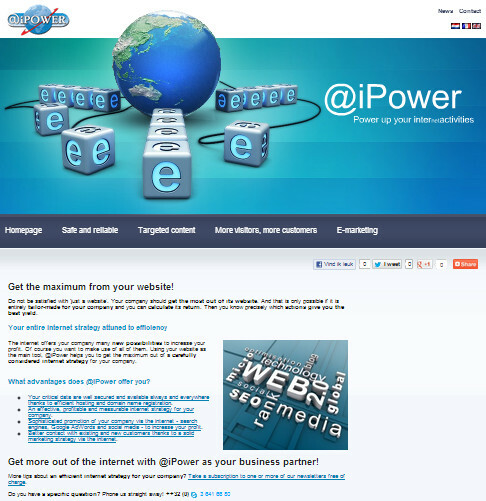 Are you a loyal hosting or domain name customer of @iPower? Then you will undoubtedly find exactly what you are looking for on this website. Is this your first time working with @iPower? Then maybe this website is too technical for you, with too much information that may not seem useful to you right now. In that case, we would like to refer you to our ‘virtual window display’ at www.ipower.eu. There you will find a clear overview of the information pertaining to our other services.